October 25 2015. It was a great day of cross country racing on the 18th of October at Saratoga Spa State Park in Saratoga Springs NY. It was a mix of clouds and sunshine with the occasional hint of a snow flake or two in the air. Many runners opted for gloves and hats and a number wore more than the customary racer's singlet, but the footing was good so no worries! The individual races are covered first followed by age-grading, followed by teams. Following the description of the Overall best times, the age groups follow, then age-grading (top 5 by gender plus all who earned Elite Performance Medals), then teams and, finally my mythical age-grade team champions. Overall Race. 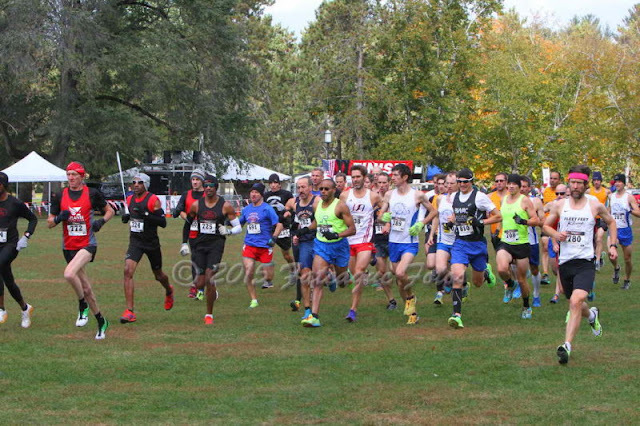 Although a list of overall finishers was compiled based on time, there were no awards on tap. 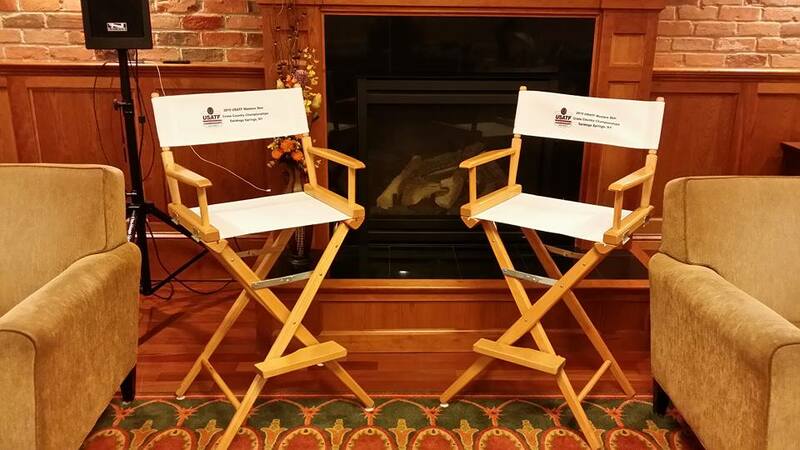 The top 2 women and top 2 men, based on age graded performances each received handsome, locally crafted Director's Chairs with the USATF logo. Apart from that, the awards were all based on either age-grading, age groups or teams. So the runner with the fastest time got bragging rights. This is just as well as on the Men's side, the overall winner, by time, did not compete in the same race as the 2nd place finisher, a comparatively rare event. Women. All of the women ran in a single race. 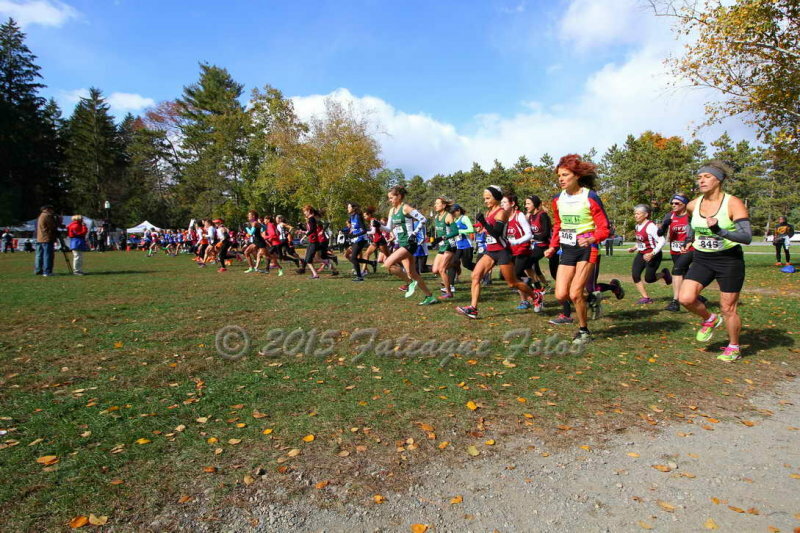 The favorites ahead of time appeared to be Marisa Sutera Strange (Pleasant Valley NY) who won national championships earlier this year at Syracuse (5K road) and Dedham (10K road). Based on looking at the early October results from Syracuse, I predicted that Renee Tolan (Clifton Park NY) and Jennifer St. Jean (Darien CT) would be strong competitors for the win. All of that was accurate but I had overlooked the running prowess of an entrant from the west coast, Janet McDevitt (Bainbridge Island WA). McDevitt is a powerhouse on the west coast but does occasionally come east for XC runs. She finished 3rd overall in last year's Club Cross Country Championships at Bethlehem PA.
Another overlooked runner was Sascha Scott (Syracuse NY). 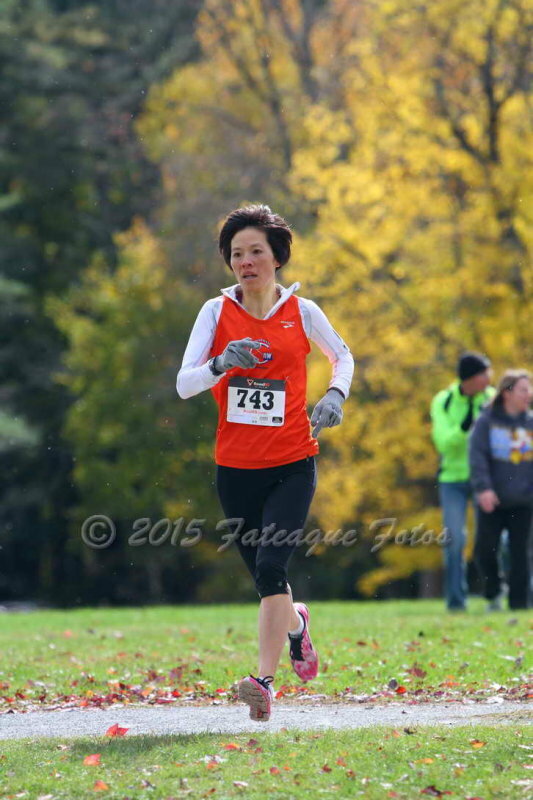 She ran Syracuse as an Open runner; in the interim she joined the Masters ranks. 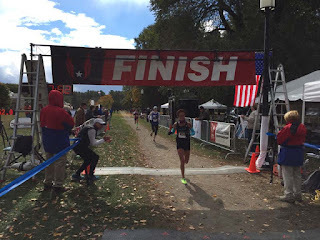 She enjoyed a great welcome to Masters competition--a terrific race and a medal to take home! McDevitt made certain the trip from coast to coast was worth it as she took it out strongly and eventually built enough of a gap to hold off the fast-closing Tolan by 3 seconds. McDevitt took first in 17:44. 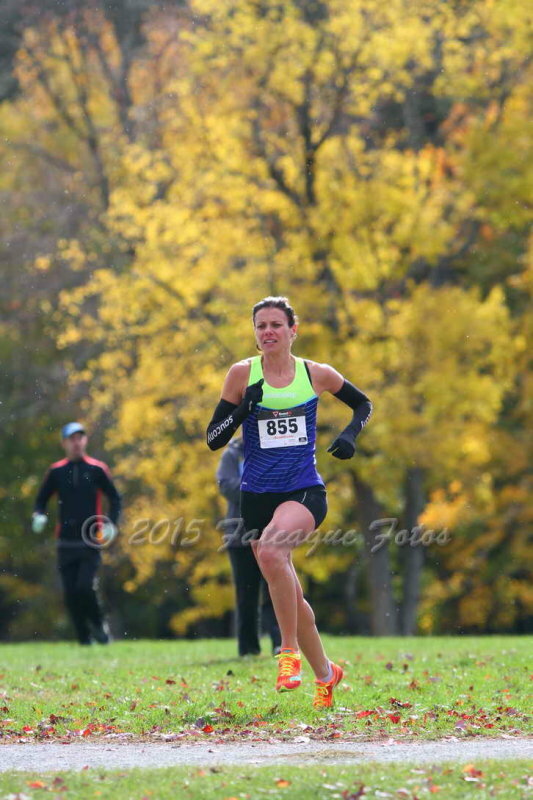 At Syracuse, Sutera Stange had been able to hold off Tolan but not today as Tolan nailed 2nd place. A few seconds back from Tolan, Sutera Strange and Scott were locked in a terrific battle to be the third runner across the line. In the end, Sutera Strange prevailed by a single second. Two seconds later St. Jean crossed the line in 5th. Men. I had predicted this would be largely a repeat of the 5K road championships at Syracuse 2 weeks prior. I picked Chad Newton (Pisgah Forest NC), Philippe Rolly (McLean VA), and Nat Larson (Amherst MA) in that order. I was unaware of Greg Putnam (Stoneham MA) who would make things interesting. 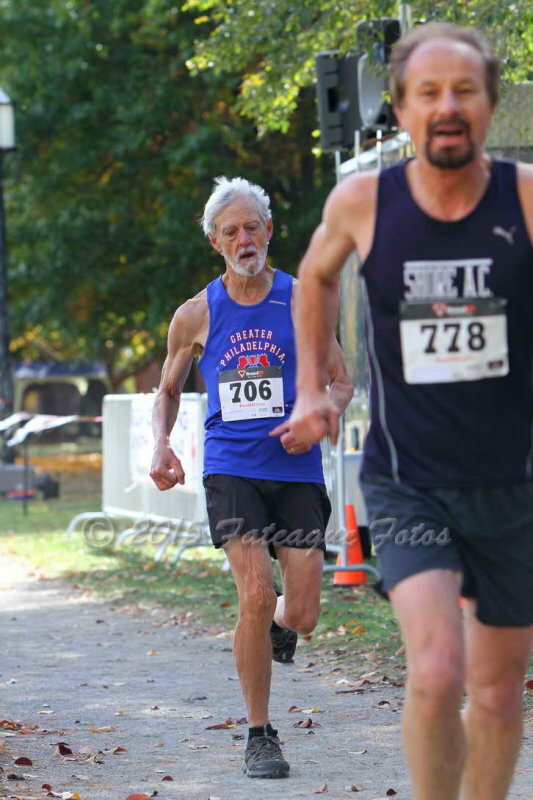 Although I knew how strong a runner Larson was out of the 50+ group, I did not know about Mike McManus (West Linn OR) but now I do! The overall race was in two parts. In what was expected to be the main event, the 40+ group, it rapidly evolved into a battle primarily between three runners, Newton, Rolly, and Putnam. In the end Newton had too much left for the other two as he pulled away to win. Although Rolly was given the same time, Newton was the clear winner. Putnam was 1 second back in 3rd place. But that was not the full story. In the 50+ race, run separately, McManus ran away from everyone to beat his closest rival by almost a half minute, and Newton by 9 seconds to claim the bragging rights that go with the fastest time of the day! 40-44. This result can be read off the account above of the overall contest. It was: McDevitt 17:44; Tolan 17:47; Scott 17:55. 45-49. Predicted contenders included Emily Bryans (Schenectady NY), Audra Naujokas-Knapp (Rochester NY) and based on distance to travel, Cecilia Regan, of the Greater Philadelphia TC. But, as it turned out, Regan did not make the trip after all. Fiona Bayly (NY NY) did make the trip. With two low 18's road 5K's and a 5:12 in the Fifth Avenue Mile, she was a force to be reckoned with. In the end it was Bayly by a ton even though Bryans ran a terrific race. Bryans took 2nd by over a half minute. Jennifer Harvey (New York NY) took 3rd with Naujokas-Knapp in 4th. 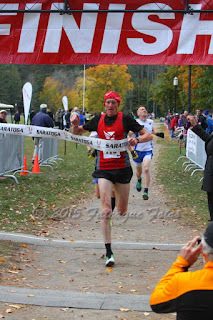 Bayly 18:24; Bryans 18:40; Harvey 19:12. Stobbe broke away from Jasper and Sargent who came in together 7 seconds behind her, to take 3rd place. 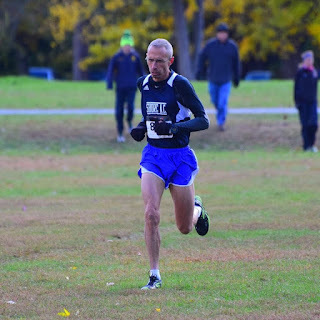 Sutera Strange 17:54; Caulfield 19:55; Stobbe 20:07. W55. Based on a quick scan of entrants I guessed that Genesee Valley Harrier teammates Colleen Magnussen (Geneseo NY) and Marie White would take 1st and 3rd with Nancy Simmons (Belvedere CA) breaking them up in 2nd. Simmons was stronger than that and there were two other Mid-Atlantic runners who figured in the outcome. White did not run; Magnussen ran well but was outdistanced on this day. 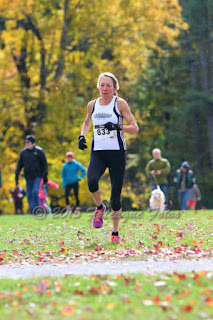 Simmons came in 1st in 19:44 to take the gold by a full minute ahead of Beth Stalker (Burnt Hills NY). 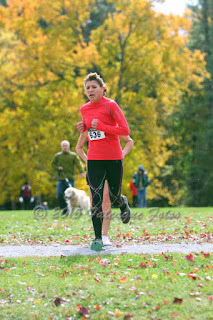 Cheryl Bellaire (Wayne PA) was another minute or so back in 3rd place. Simmons 19:44; Stalker 20:44; Bellaire 22:07. W60. Kathy Martin (Northport NY) was the clear favorite. 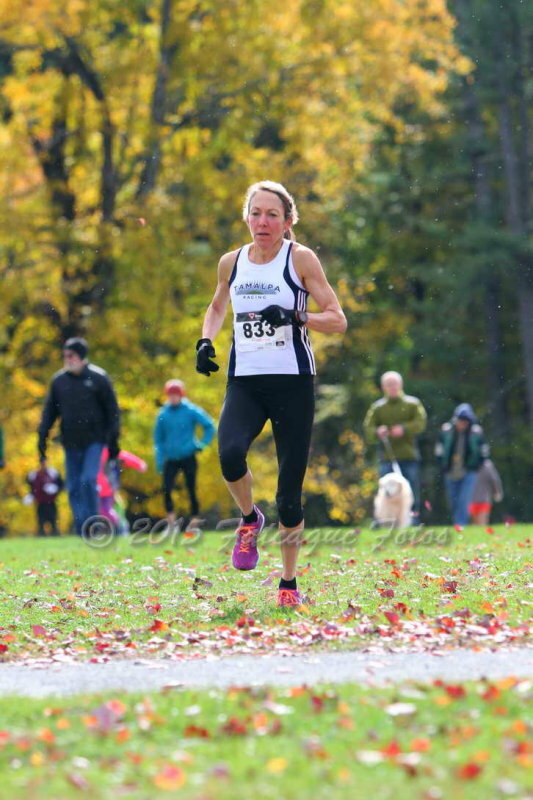 After her I anticipated that Genesee Valley Harrier teammates, Sharon Moore (Rochester NY) and Coreen Steinbach (Pompey NY) would fight it out for 2nd and 3rd. Martin took care of things up top, breaking 20 minutes to win by over a minute. But Mo Bartley (Auburn CA) had not come all the way from California to let the Easterners have it all their way. 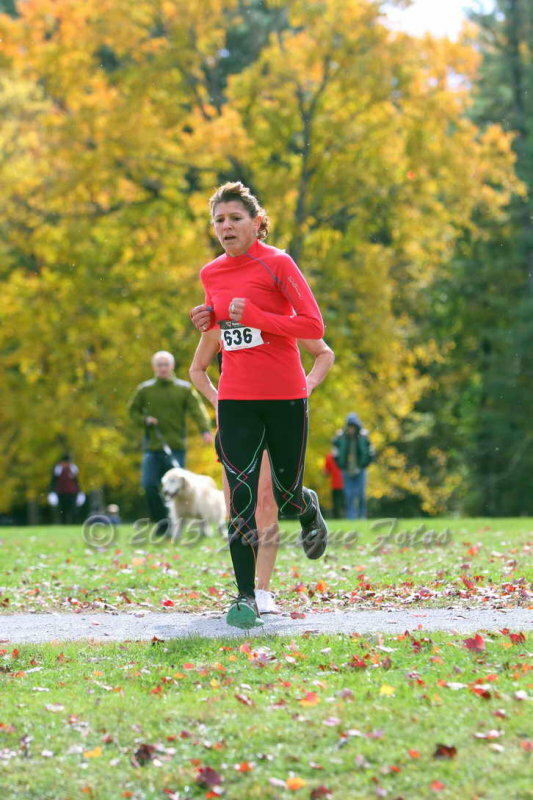 She took the silver 40 seconds ahead of Nora Cary (Morristown NJ). Moore finished 4th and Steinbach a few places back on this day. Martin 19:57; Bartley 21:00; Cary 21:40. W65. I thought JoAnna Rowlands (Concord CA) and Carolyn Smith-Hanna (Pittsford NY) would go 1-2 and I was not disappointed. I missed 3rd place though. Rowlands took the gold in 23:55 with Smith-Hanna 47 seconds back. 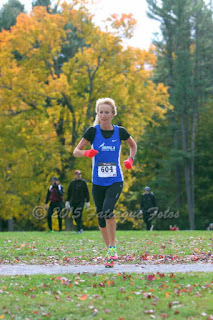 Local runner, Margaret Henders (Saratoga Springs NY), ran a fine race to capture 3rd a half minute back. Rowlands 23:55; Smith-Hanna 24:42; Henders 5:19. W70. No one in this category. W75. 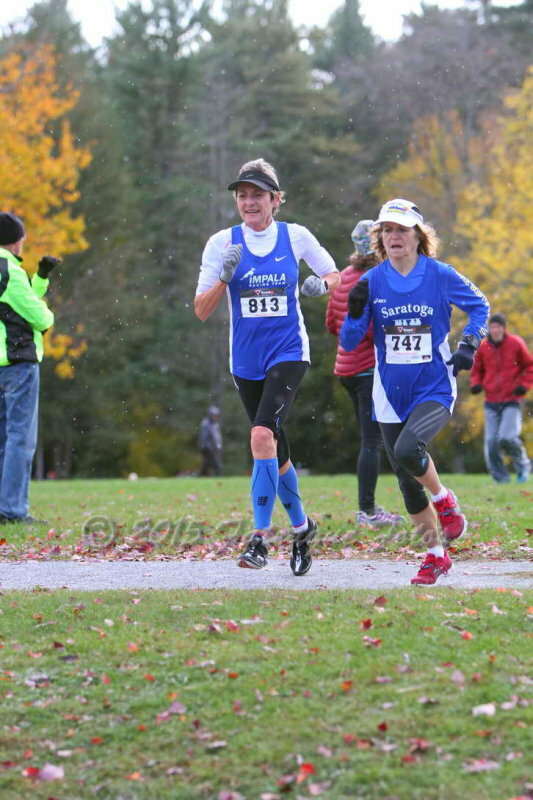 I thought Madeline Bost (Randolph NJ) would make it two in a row--1st at Syracuse and then here at Saratoga but Marge Rajczewski (Ballston Lake NY) had other ideas. 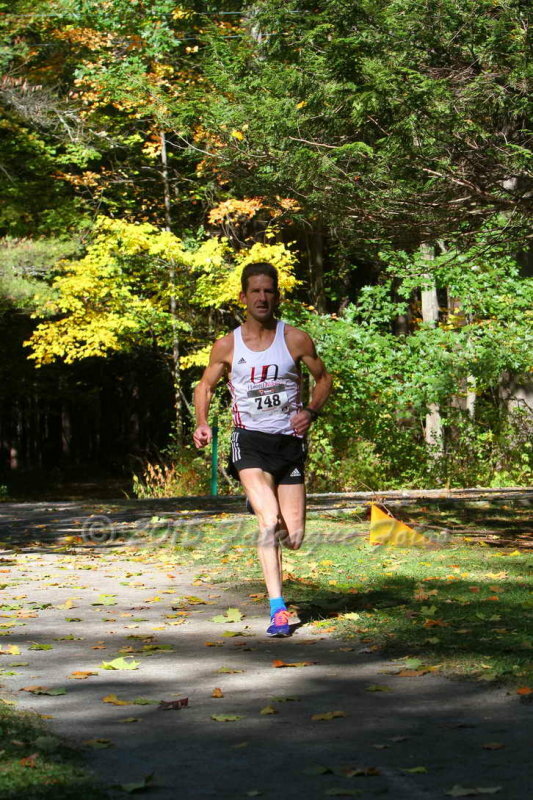 Rajcewski ran a strong race to claim gold in 30:39. A few minutes later Bost claimed the silver. 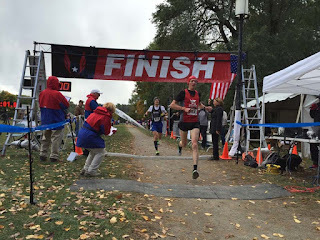 Rajczewski 30:39; Bost 35:51. W80. 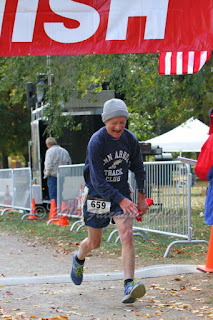 Mary Harada (West Newbury MA) came all the way across from north of Boston to claim the gold medal in this category and also claim the title of the oldest finisher on the women's side at 80 years of age. Harada 37:34.
to take 2nd place by 4 seconds. Rolly 16:01; Bell 16:22; O'Connor 16:26. M45. This race was loaded with talent. Chad Newton and Greg Putnam ran 1-2 at the top, finishing a second apart. But Matt Chaston (New York NY) and Tim Van Orden (Bennington VT) were having an equally fierce battle a dozen seconds back. In the end Chaston was able to pull away to take the bronze medal with a 3 second margin! Newton 16:01; Putnam 16:02; Chaston 16:15. M50. As implied from above, Mike McManus (West Linn OR) ran away from a very talented group of runners to take the group medal by nearly a half minute. There was a spirited battle for the other two spots on the podium. A mere 6 seconds separated 2nd from 4th. 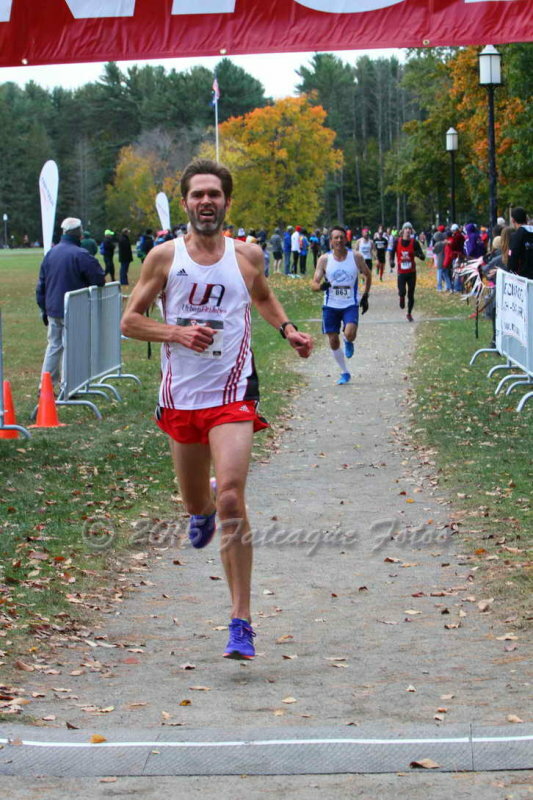 Mark Hixson (Simsbury CT) pulled away to take 2nd in 16:19. A few steps back Nat Larson (Amherst MA) was able to carve out 2 minutes of separation to take the bronze medal away from Mike Nier (Rochester NY) who ran a terrific race but finished just off the podium. McManus 15:52; Hixson 16:19; Larson 16:23. M55. One of my picks, Charles Shields (Abington PA), was definitely in the mix of this tightly contested division. John Noonan (Ballston Spa NY) gave it his all but came up 5 seconds short. Twenty-five seconds back Thomas Dalton (Schenectady NY) pulled away from Erik Wight (Amherst MA) to claim the bronze medal by 6 seconds! Shields 18:06; Noonan 18:11; Dalton 18:36. M60. This was another race loaded with talent. Luckily I was still able to predict two of the three medalists. I knew that Reno Stirrat (Rockaway NJ) who had a terrific summer of racing, had been disappointed with his performance at Syracuse. I figured that was all the incentive needed for Stirrat to run an exceptional race and we were not disappointed. 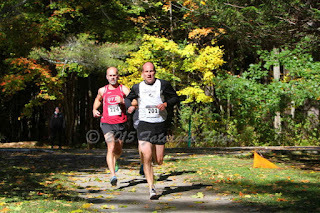 Stirrat pulled away and by the end had a 13 second gap over the 2nd place finisher. But which runner would claim silver? It was quite a struggle involving Steven Caladonna (Yorktown Height NY), Mark Rybinski (Manlius NY), and Brian Cummins (Cortland NY). Only 7 seconds separated the three of them at the finish line! Caladonna held a 5 second lead over Rybinski when he crossed the line to nail second place. Rybinski edged Cummins by 2 seconds for the bronze medal. Stirrat 18:14; Caladonna 18:27; Rybinski 18:32. M65. Bill Dixon (Brattleboro VT) the M65 gold medalist from Syracuse and a perennial contender for age group Runner of the Year was expected to claim the victory in this group. Dixon did not disappoint, taking the crown by a half minute in 18:40. 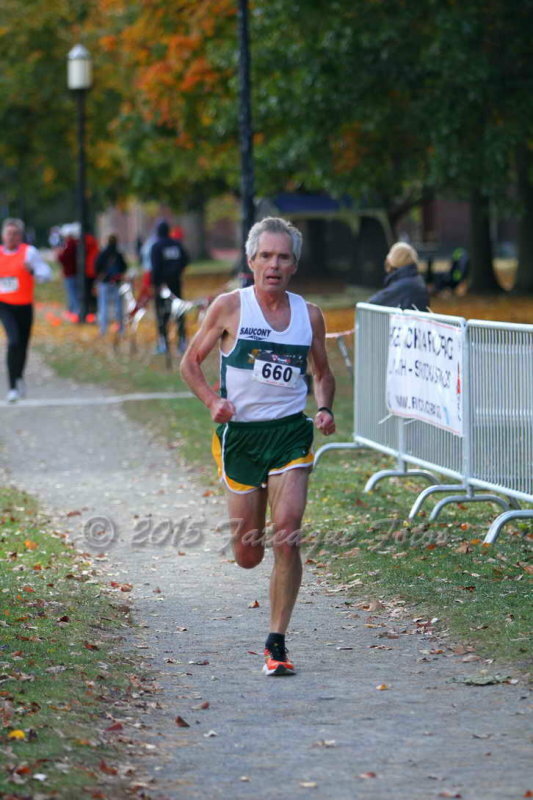 Bob Giambalvo (Delhi NY) ran a strong race to take the silver medal handily over Frank Rucki (Chicopee MA). Seven seconds back from Rucki was Doc Rappole (Bemus NY) still working on regaining the fitness he displayed in the first half of 2015 when he took gold at the USA Masters XC Championship in Boulder CO. Dixon 18:40; Giambalvo 19:10; Rucki 20:05. M70. I thought Przemyslaw Nowicki (Homdel NJ) would be on the podium but he was the only medalist with whom I was familiar. 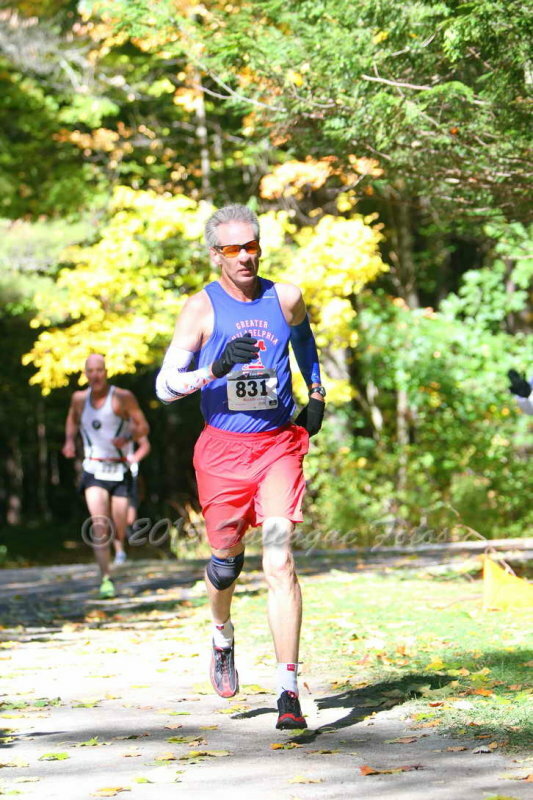 Now I know about John Carlson (Copake NY) who was able to establish a gap over Nowicki and hold it to the finish where he took gold by 25 seconds. Nowicki, in the meantime, had all he could handle with Thomas Jennings (Fort Washington PA). In the end it was Nowicki and Jennings in that order, separated by only one second! .Carlson 21:30; Nowicki 21:55; Jennings 21:56. M75. I figured this would be a battle between John Elliott (Columbia MD), Ron Mastin (Woodstock GA), and Roland Cormier (Jackson NJ). That was correct but the order was a bit off. 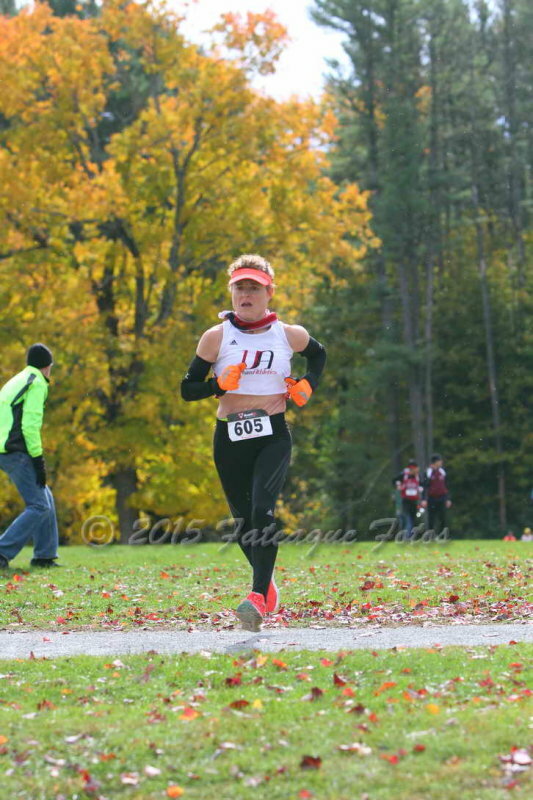 On this day at this XC course, Mastin was able to handle everything Elliott could throw at him. In the end it was Mastin by over a minute with Cormier another 11 seconds back claiming the bronze medal. Mastin 23:05; Elliott 24:12; Cormier 24:23. M80. Jon Desenberg (Ann Arbor MI) took this group by many, many minutes but the silver medalist, Walter McConnell (Bolton Landing NY) enjoyed the distinction of being the oldest finisher of the day on the men's side at 84. Emily Bryans 86.64%; Janet McDevitt 86.60%; Marilyn Caulfield 85.76%; Nora Cary 85.56%; Lorraine Jasper 85.38%; Renee Tolan 85.31%; Beth Stalker 85.25%; Jo Anne Rowland 84.74%; Sascha Scott 84.67%; Jennifer St Jean 84.51%; Sharon Moore 84.09%; Belinda O'Brien 83.78%; Coreen Steinbach 83.58%; Karyl Sargent 83.47%; Jill Miller-Robinet 83.40%; Jennifer Harvey 83.37%; Cathrine Wolden Lev 83.29%; Heather Webster 83.07%; Judy Stobbe 82.14%; Carol Bischoff 80.76%; Mary Swan 80.04%. Mark Zamek 89.70; Chad Newton 89.38; Matt Chaston 88.75; Greg Putnam 88.64; Tim Van Orden 88.48; Reno Stirrat 88.30; Bob Giambalvo 87.64; Jonathan Weatherly 87.59; Philippe Rolly 87.44; Peter Mullin 86.98; Armando Oliveira 86.84; Steven Calidonna 86.55; Francis Burdett 86.44; Steve Bell 86.20; Mark Rybinski 86.16; Dave Dunham 86.09; Brian Cummins 86.00; Charles Shields 85.40; Kevin Forde 85.35; Joe Shairs 85.17; Stephen Chantry 85.08; John Noonan 85.01; Brad Kelley 84.87; David Bischoff 84.66; Larry Rechtin 84.53; Ron Lombardi 84.14; James O'Connor 84.01; Joseph Regan 84.00; Peter McNeill 83.97; Thomas Dalton 83.78; Francis Sarno 83.77; Matthew Guild 83.75; Alejandro Heuck 83.74; Joshua Perks 83.67; Frank Rucki 83.64; Ken Wempe 83.53; Mark Williams 83.52; Theodor Schnaufer 83.44; Alan Bernier 83.42; Carl Johnston 83.35; David Greenberg 83.27; Doc Rappole 83.16; Michael Strickland 82.95; Dale Flanders 82.80; Erik Wight 82.66; Brad Slavens 82.59; Volker Burkowski 82.50; Brent Fields 82.31; Devin Croft 82.27; Daniel Dern 81.94; James Pawlicki 81.77; Ben Nephew 81.76; Paul Vandegrift 81.73; John Crawford 81.73; Gary Moore 81.70; John Carlson 81.24; Ron Mastin 81.21; Bill Beyerbach 81.19; Frank Gioia 81.11; Martin Fitzgerald 81.05; Jeff Conston 81.03; John Griego 81.02 ; Jim May 80.92; Mark Chiusano 80.92; David Padula 80.91; Gary Radford 80.90; Jack Arnold 80.90; Ryan Mitchell 80.89; Paul Bazanchuk 80.71; Przemyslaw Nowicki 80.66; Michael Gross 80.65; Don Morrison 80.65; Thomas Jennings 80.60; Harold Nolan 80.48; John Elliott 80.31; Frederick Kitzrow 80.26; Patrick Gaughan 80.24; Geoffrey Towell 80.08. 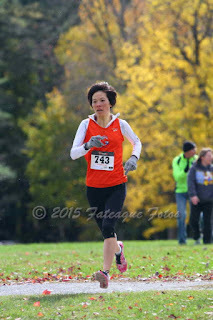 W40+: The Syracuse Track Club had the first finisher across the line in Sascha Scott but her two teammates were far back in this talented pack. The Westchester Track Club had the same problem as Jennifer St. Jean's teammates were not up close to her 2nd place finish. The Genesee Valley Harriers did better. Heather Webster finished 3rd across the line in team competition and her teammates (Wakenda Tyler and Melissa Senall) were only a minute back. But in that one minute, Urban Athletics NYC packed in their 3 runners (Fiona Bayly, Catherine Wolden Levine, Jennifer Harvey) in 4th, 5th and 7th to take the gold. GVH got the silver and the Syracuse Track Club (Scott, Sargent, Wheeler) nailed the bronze. 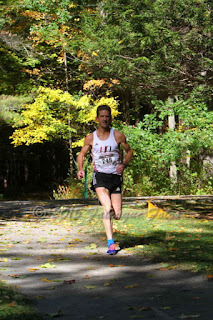 Urban Athletics NYC ; Genesee Valley Harriers ; Syracuse Track Club . 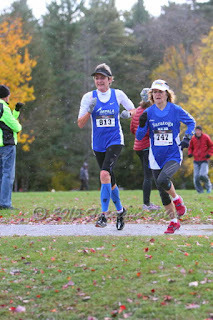 W50+: The Athena Track Club took this competition easily; Marisa Sutera Strange and Lorraine Jasper came in 1-2 for Athena and though they had to wait a bit for their 3rd runner, Cheryl Bellaire finished ahead of the #3 runners for all other teams. There was a doozy of a race for 2nd though between the GVH and the Willow Street AC. After the first 2 runners were in for each team (Bischoff and Lindbloom for GVH; Stalker and Buck for Willow Street), GVH led 9 to 11. ut Willow street had a slightly tighter pack as their 3rd runner finished 46 seconds back from Buck while GVH's 3rd runner finished over a minute back. The result was a tie and the tie was broken by Rule 7.9.B which apparently says that the team whose 3rd runner finishes better is awarded the better team finish. Athena Track Club ; Willow Street AC ; Genesee Valley Harriers . W60+: The Impala Racing team from California and the GVH team from New York had a real battle as the top runners for each team finished close to the top runners for the other team. But, as it happened, in each case the Impala team came out on top taking 1st, 3rd and 5th (Mo Bartley, Jill Miller-Robinette, Jo Anne Rowland) to GVH's 2nd, 4th, and 6th (Sharon Moore, Belinda O'Brien, Cindy Ingalls). The local Saratoga Stryders team (Henderson, McNamara, Clark) took the bronze medal. Impala Racing Team ; GVH ; Saratoga Stryders . M40+: It was a tight contest after the first two runners between the Central Mass Striders and the Atlanta Track Club. ATC's Chad Newton and Steve Bell came in 1st and 4th, sandwiching CMS's Greg Putnam and Tim Van Orden in 2nd and 3rd so it was 5-5. But then CMS's depth took over as they brought in Joshua Perks, Alan Bernier and Ben Nephew in 5th, 6th and 8th before aTC's 3rd runner could come in. 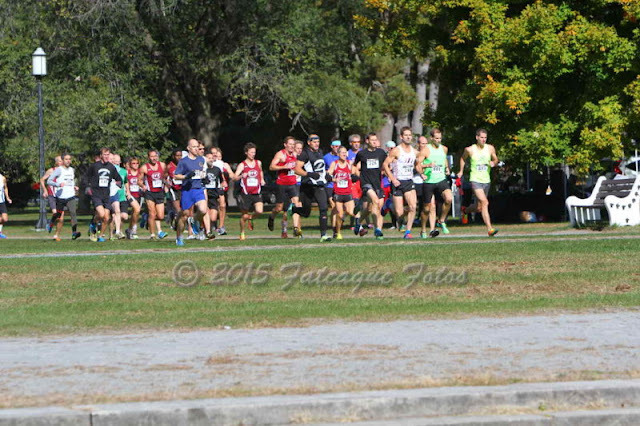 Although not up to the CMS challenge, ATC's 3rd through 5th runners (Brent Fields, Ken Wempe and Brad Slavens) had more than enough speed to match up with the 3rd place team, CPTC (Central Park Track Club) New Balance (Oliveira, Kelley, Greenberg, Lau, Millone). CMS 24; ATC 43; CPTC NB 75. M50+: This was a dominant win for the GVH team (Mike Nier, Carl Johnston, Theodor Schnaufer, Dale Flanders, David Bischoff) who took 1st and then 3rd through 6th for 19 points. 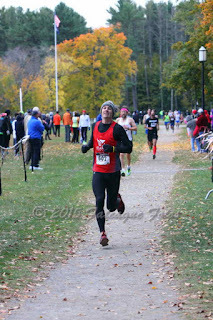 For the first 4 runners it looked like the Greater Philadelphia Track Club (Kevin Forde, Larry Rechtin, Charles Shields, Jim Rinker, Carl Stocking) would have an equally dominant 2nd place finish as they were ahead 29 to 71 once the Adirondack Athletic Club's (John Noonan, Thomas Dalton, Kevin Creagan, Christopher Buckley, John Sestito) 5th runner finished. But now GPTC needed their 5th runner to finish higher than 42nd. Stocking ran a gutsy race and got Greater Philadelphia the place they needed. GVH 19; GPTC 58; AAC 71. M60+: GVH (Mark Rybinski, Bill Beyerbach, Frank Gioia, Doc Rappole, Jim May) and the Shore AC (Reno Stirrat, Mark Chiusano, Patrick Gaughan, Harold Nolan) were fighting it out once again. Stirrat got the win so that started Shore AC off well but then GVH got 2nd and 4th to balance Shore AC's 1st and 5th. It came down to the 3rd runner and Gioia had a little more in the tank than Gaughan as he took 6th to Gaughan's 9th. The Greater Springfield Harriers (Rucki, O'Neill, Hernandez, Clark, Childs) beat out the Syracuse Track Club for the bronze medal by 12 points. GVH 12; Shore AC 15; Greater Springfield 33. M70+: The Shore AC (Przemyslaw Nowicki, JL Seymore, Roland Cormier) was in another knock down, drag out, battle here, this time with the Atlanta Track Club (Ron Mastin, Morris Williams, Charlie Patterson, Andrew Sherwood). Nowicki got the first that Shore was hoping for but Mastin took 2nd. When Seymore took 3rd, things were looking good for Shore but then ATC's Williams and Patterson took 4th and 5th. That gave ATC a completed team score of 11. Shore needed their 3rd runner, Cormier to come in next in 6th place or ATC would get the win by Rule 7.9.B [see above W50+ teams]. Luckily they did not have long to wait as Cormier was only ten seconds back of Patterson. 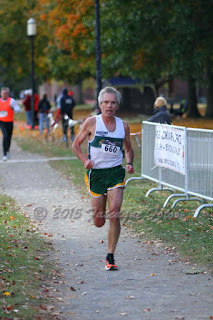 The Clifton Road Runners Club team (Fiory, Ash, Lalumia, Swan) beat out the local team, the Adirondack Athletics Club, for 3rd by 5 points in another close contest.Shore AC 10; ATC 11; Clifton 26. 1. 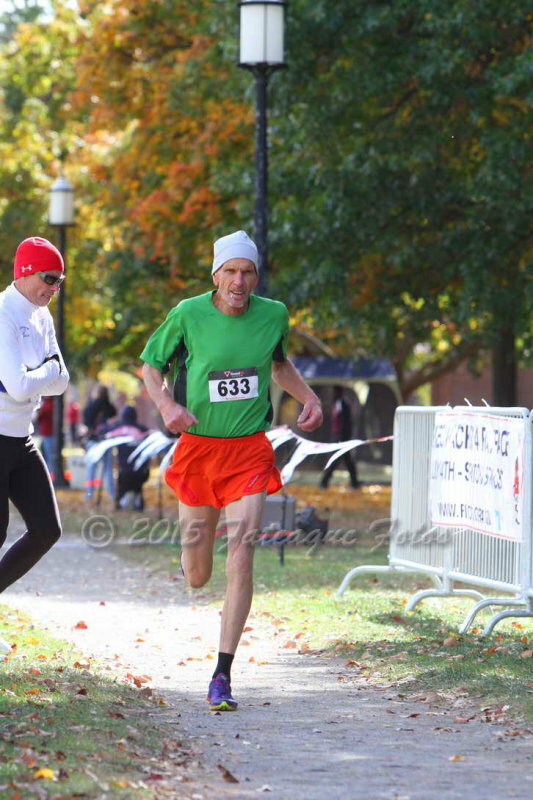 Genesee Valley Harriers (Nier, Rybinski, Bischoff, Schnauferr, Johnston) 5+20+29+43+45 = 142.